The work of Valerio Fabbretti exudes a youthful energy and charm that you just don’t see much of these days. His beautiful work is rooted in traditional illustration and his skills as a draftsman are evident in just about everything he does. Visit his website for some really fantastic samples of his children’s book illustrations and visual development skills. 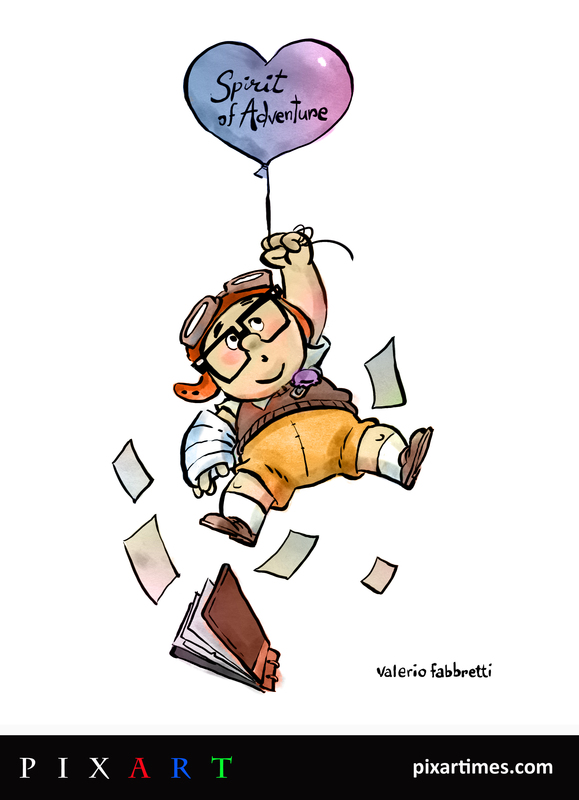 Our thanks to Valerio for creating this wonderful tribute to Pixar’s UP just for us. We love it! Just like everyone in the whole Universe, I was touched by the very charming love story of Carl and Ellie. Love and Adventure! Since Valentine’s Day was coming up, I wanted to give my very humble homage to a great movie and awesome character! My biggest inspirations are the incredible European comic books like Topolino, Torpedo, Blueberry and Tin Tin along with the classic Disney animated movies. My favorite of all – Robin Hood. I highly recommend Chris Oatley’s website! He is such an inspiring and talented artist and teacher whom I was very lucky to meet at CTN this year. He is a very sweet person too! Daniel Hashimoto is a genius visual effect artist and Mandy Richardville is the sweetest children’s book writer I have ever met! They are the brilliant creators of Action Movie Kid and full time parents of a part time superhero, James! Along with millions of super creative and charming ideas, Hashi and Mandy have written a super fun children’s book that I was very honored to illustrate: Action Movie Kid! And just a few days after, another super fun book series is coming up: Hamster Holmes! Artist Jerrod Maruyama has been an incredible member of our team here at The Pixar Times. He was a regular contributor here since 2010, working with numerous talented artists on curating beautiful pieces of artwork inspired by Pixar films for our PixArt section. I worked closely with Jerrod over four years ago to establish the online art gallery. However, due to an increasingly busy schedule, Jerrod will no longer be able to serve as curator. That is an incredible thing, though, because a talented artist getting more work is as it should be! He will certainly be missed here, but not forgotten, as PixArt will return after a brief hiatus, just with someone else at the helm. We wish Jerrod the best as he moves on to exciting things. Keep a look out for his work over at jmaruyama.com – you will see there that he has become one of the most popular artists of everything Disney and adorable.